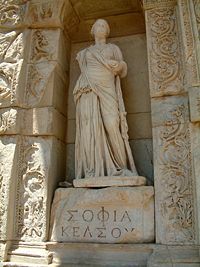 Personification of wisdom (in Greek, "Σοφια" or "Sophia") at the Celsus Library in Ephesos, Turkey. Wisdom is a type of knowledge, similar to phronesis, that includes judgment for its proper applications to a given situation. The status of wisdom as a virtue is recognized in various cultural, philosophical, and religious traditions. Most psychologists regard wisdom as distinct from the cognitive abilities measured by standardized intelligence tests. As such, in general, wisdom is determined by one's ideals and principles that govern all actions and decisions. Applications of personal wisdom include one's ethical and social guidelines in life that determines one’s unique personality, short and long-term goal(s) pursued in life (spiritual or materialistic for example), perspective on life, and social attitudes. Beginning with the ancient Greeks, European cultures associate wisdom with virtue. Metis and Athene are associated with wisdom from earliest times. For example, Aristotle talks about the virtue of wisdom in relation to courage and moderation, and in the Roman Catholic church, wisdom (Prudence) stands with justice, fortitude, and moderation as one of the four cardinal virtues. Plato's dialogues mention the virtue of wisdom, as knowledge about the "Good" and the courage to act accordingly. The Good would be about the right relations between all that exists. The Good, as a Platonic Form, would involve the perfect ideas of good government, love, friendship, community, and a right relation to the Divine. In the Christian Bible, the magi (or "wise men") are sent by God to give the newly born Jesus three types of gifts. Wisdom is also represented by the sense of justice of the lawful and wise king Solomon, who asks God for wisdom in 1 Kings 3. Proverbs 9:10 says: "The fear of the Lord is the beginning of wisdom," and 8:13 "To fear the Lord is to hate evil." The Catholic and Orthodox deuterocanonical books of the Bible include the Book of Wisdom (Wisdom of Solomon). There is an oppositional element in Christian thought between secular wisdom and Godly wisdom. The apostle Paul states that worldly wisdom thinks the claims of Christ to be foolishness. However, to those who are being saved, Christ represents the wisdom of God (1 Corinthians 1:17-31). Also, Wisdom is one of the Seven gifts of the Holy Spirit. In Islam, according to the Qur'an, Prophet Muhammed was chosen by God to represent his wisdom. The Prophet Muhammad said that: "Fearing God in your actions and intentions, and knowing that Almighty God is watching you wherever and whenever you are is the head/peak of wisdom." In addition, Islam also mentions that a wise man with the name of Luqman once told his son to: "Sit with the learned men and keep close to them. Allah gives life to the hearts with the light of wisdom as Allah gives life to the dead earth with the abundant rain of the sky." Confucius stated that wisdom can be learned by three methods: Reflection (the noblest), imitation (the easiest), and experience (the bitterest). According to Doctrine of the Mean, Confucius also said, "Love of learning is akin to wisdom. To practice with vigor is akin to humanity. To know to be shameful is akin to courage (zhi,ren,yi—three of Mengzi's sprouts of virtue)." Compare this with the beginning of the Confucian classic Great Learning, which begins with "The Way of learning to be great consists in manifesting the clear character, loving the people, and abiding in the highest good." One can clearly see the correlation with the Roman virtue "prudence," especially if one transliterates clear character as clear conscience. In Taoism, Practical Wisdom may be described as knowing what to say and when to say it. Psychologists have gathered data on commonly held beliefs or folk theories about wisdom. These analyses indicate that although "there is an overlap of the implicit theory of wisdom with intelligence, perceptiveness, spirituality and shrewdness, it is evident that wisdom is a distinct term and not a composite of other terms." Personality theorist Erik Erikson related wisdom to the last stage of his eight-stage theory of psychosocial development. Erikson's theory spans the entire lifespan and frames each stage in the form of internally-generated questions or tensions. Erikson claimed that in the last stage of human development, from approximately 65 years to death, individuals must resolve a psychological conflict between integrity and despair. He proposed that attaining wisdom is a favorable resolution and product of this conflict. Strength here takes the form of that detached yet active concern with life bounded by death, which we call wisdom… Not that each man can evolve wisdom for himself… To whatever abyss ultimate concerns may lead individual men, man as a psychological creature will face, toward the end of his life, a new edition of the identity crisis which we may state by the words "I am what survives me." Thus, within Eriksonian theory, wisdom universally surfaces as an optimal potential outcome of the human experience. In the 1970s, Vivian Clayton pioneered the academic study of wisdom. Clayton "is generally recognized as the first psychologist to ask, in even faintly scientific terms, 'What does wisdom mean, and how does age affect it?'" Clayton's work caught the attention of Paul Baltes, who later founded the Berlin Wisdom Project at the Max Planck Institute for Human Development in Berlin, Germany. Another wisdom researcher, sociologist Monika Ardelt, has developed a "Three-Dimensional Wisdom Scale," a test that individuals can take for a numerical assessment of their wisdom on a scale of one to five. The number of academic publications about wisdom increased significantly from 1984 to 2000. Nevertheless, according to Jacqui Smith, one of Baltes's collaborators, the subject is not completely accepted in academia. ↑ USC-MSA Compendium of Muslim Texts, Translation of Malik's Muwatta, Book 59: Knowledge. Retrieved December 9, 2007. ↑ The Dhammapada, v. 256. ↑ R.J. Sternberg, Implicit theories of intelligence, creativity, and wisdom, Journal of Personality and Social Psychology, 49, 607–62. ↑ S.C. Brown and J.A. Greene, The Wisdom Development Scale: Translating the conceptual to the concrete, Journal of College Student Development, 47, 1–19. ↑ E. Erikson, Identity: Youth and Crisis (New York: Norton, 1968). ↑ Stephen S. Hall, The Older-and-Wiser Hypothesis. Retrieved December 17, 2007. Radhakrishnan, S. The Dhammapada. New York: Oxford University Press, 1950. Ross, Nancy Wilson. Three Ways of Asian Wisdom: Hinduism, Buddhism, Zen, and Their Significance for the West. New York: Simon and Schuster, 1966. Sharon Ryan. Wisdom, Stanford Encyclopedia of Philosophy. Where is the Wisdom We have Lost in Knowledge?. Wisdom: The Interval Between the Notes. Book on Wisdom from psychologist Paul Baltes. This page was last modified on 4 August 2013, at 18:59.